With our purpose-built facility, our passionate seasoned staff of vintage car enthusiasts, we can confidently help buyers and sellers of collectible vehicles purchase the vehicle of their dreams or sell their prized possession through consignment for its true market value. Our staff has over 75 years of combined experience working on classic, antique, vintage or historic vehicles specializing in British pre-emissions vehicles from the 1940’s to the 1970’s. If you share our passion and are looking to buy, sell or give one the proper care, we can help. 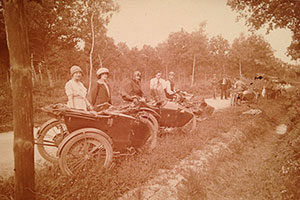 The inspiration for our company logo comes from this photograph taken by one of Clarke’s distant relatives. Willy Walsh was a French WWI pilot and observer which placed him in an open cockpit bi-plane under fire with a camera in hand. 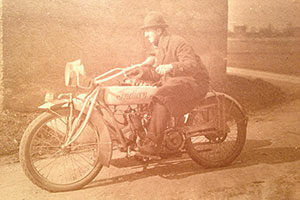 After the war he attended and photographed various motorcycle and car racing events in Europe. 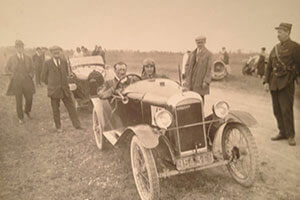 This original print was the subject for our current logo at Historic Motor Sports. Later in life Willy became a professional photographer and a professor at the University of Louisville.